Traffic in Phra Pradaeng district in Samut Prakan for Songkran 2018. BANGKOK — Avoid water-soaked, hellish Songkran traffic by checking in to real-time maps. 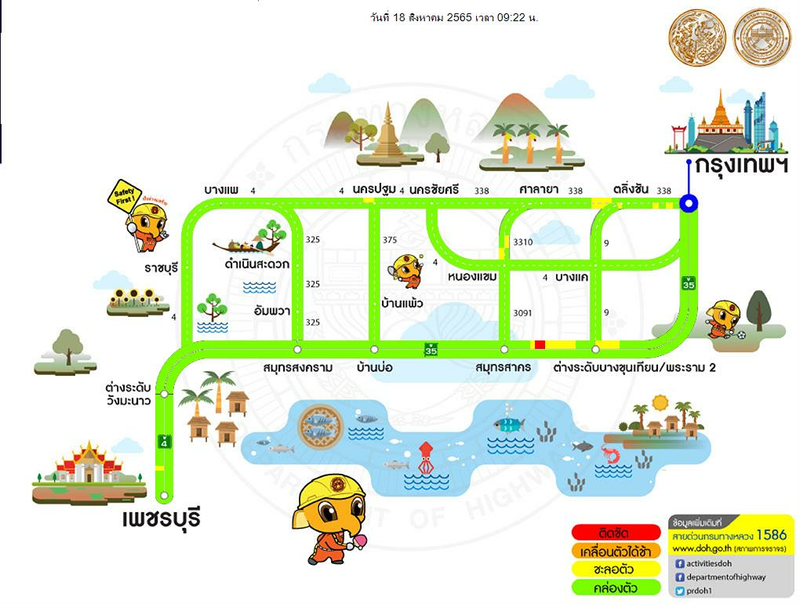 The Department of Highways released on Tuesday five real-time updating maps to help travellers find the best routes exiting Bangkok to their water-splashing destinations – or to quickly rush home still dry. Major routes on the first map include that starting with Phahon Yothin Road leading north to the Rangsit area, and out of Bangkok to Ayutthaya, Ang Thong, Sing Buri and Nakhon Sawan provinces on Highway Route 32, also known as the Asian Highway. Green means traffic is moving quickly, yellow means congestion has started to appear, orange means cars are slowly moving and red signifies heavy traffic. Purple signifies highways. Ask a Thai friend to help you read the Thai map names since there’s no English version of them. According to the Department of Highways hotline, as of Tuesday the Asian Highway around the 59 kilometer mark in Ang Thong is already starting to see some congestion. Other routes in the Bangkok map include the northeast route exiting Bangkok to Nonthaburi via Highway 340 through Suphan Buri and Chai Nat, as well as another northern road cutting through Saraburi and Lopburi to Phitsanulok. According to the eastern region map – which for some reason details routes between Bangkok and Pattaya – show that roads around Lak Si and Bang Na in northern and eastern Bangkok are already congested. 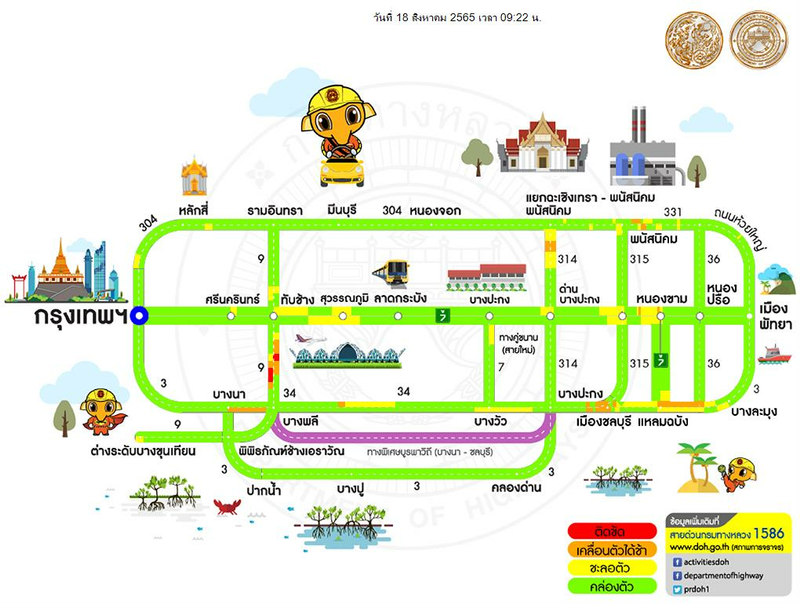 The Isaan map covers routes between Bangkok and Khon Kaen. 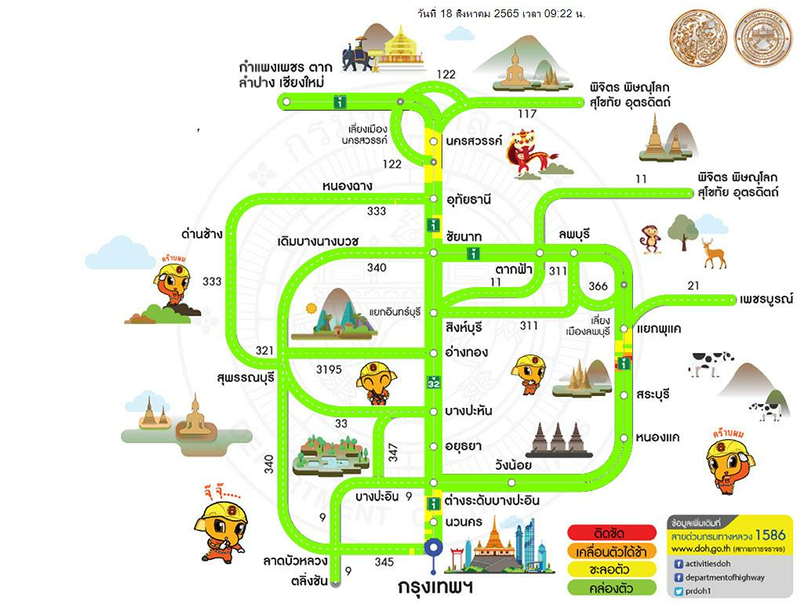 The northern map shows routes between Bangkok, Kamphaeng Phet, Tak, Chiang Mai, Phichit, Sukhothai, Phitsanuloke, Uttaradit and Phetchabun. 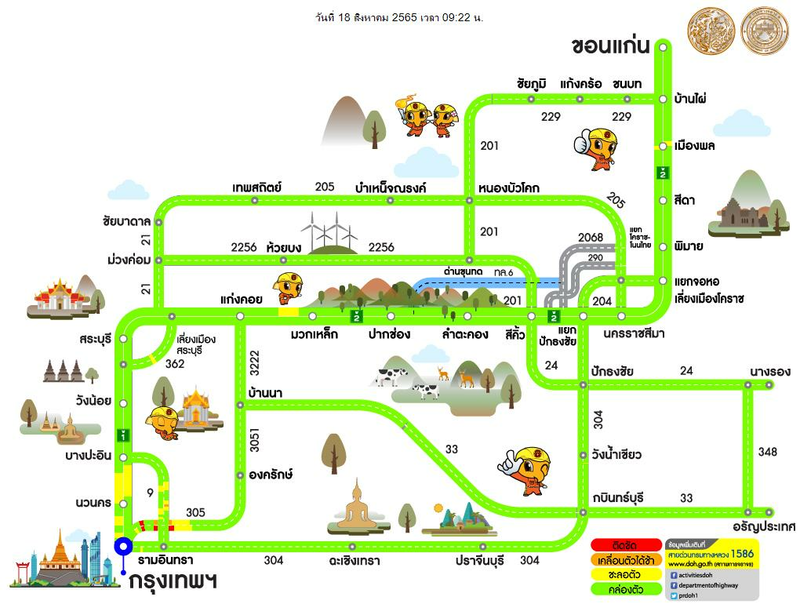 The southern region map covers roads leading southwest out of Bangkok towards Phetchaburi. One can see that capital district Bang Khae is already congested, while trafflick along the western route through Salaya is still relatively light. Traffic is famously congested this time of the year as people travel home for the Songkran holiday, which starts Saturday through to Monday. Those with questions about the real time map service can call 1586, where limited English help is available. The maps will be updated through April 18.